After your ride you'll want to dismount safely with a minimum of discomfort to your horse and yourself. Practice these steps and you will be able to get off smoothly. When learning to dismount, you should be in an area that is safe for you to practice in. At first, it is good to have a helper to hold the horse. As you will be dismounting after riding, you should be wearing comfortable clothes that don't bind, and proper footwear. A riding helmet is also essential. Your horse should be saddled and bridled. At first, you may want to practice without reins, but only if you have a helper holding the horse. Make your horse stand still quietly. Remove both feet out of the stirrups. This is important so you don’t get tangled up as you get down. Grasp both reins in your left hand, with just enough tension to pull the horse up if it steps forward. A little handful of mane can help you steady yourself. 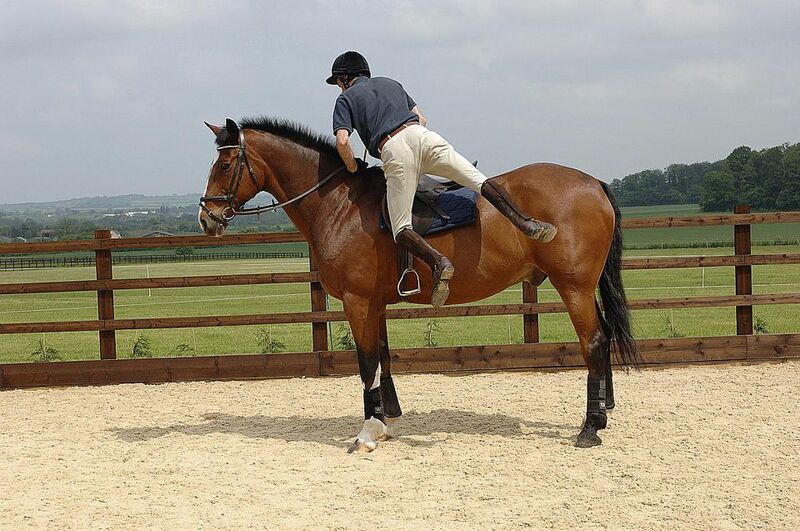 Lean forward, and with both hands on the horse’s neck just in front of the withers shift your weight onto your arms. Your seat should come a bit out of the saddle. Swing your right leg up and over the horse’s haunches. Be sure to lift it high enough to clear the horse’s haunches and the back of the saddle. You don’t want to kick your horse in the haunches, and your leg must lift high enough to clear the cantle of the saddle. Push yourself away from the horse slightly so that you don’t hit any of the equipment and land clear of his legs. The momentum of your leg and the shift of your weight over the horse’s forehand will help you vault off. Bend your knees to absorb the shock of the landing when your feet hit the ground. Straighten up and step up to balance yourself. Once you are off, grasp the reins close to the bit with your right hand, then lift the reins over the horse’s head to lead it. One hand goes under the horse’s chin and the other holds the bight of the reins so they don’t dangle on the ground. If you ride English, run the stirrups up the leathers so they don’t swing as the horse moves. After you ride, be sure to take good care of your horse, and put all of your tack away properly so that it’s ready for the next ride. Practice dismounting on the off side as well. You should be able to dismount well from either side, even though dismounting from the near, or left side is traditional. Don't swing your leg over the front of the saddle. This puts you off balance and risks a fall if your horse moves forward or sideways. You can also kick your horse in the neck or head. Some riders dismount by taking their right foot out of the stirrup and shifting their weight into the left stirrup, leaving their left foot in the stirrup until the right foot hits the ground. This puts more strain on the horse’s back and the saddle. It should only be used if the described method is impossible for the rider.